It may be a surprise to hear that a bifocal prescription doesn’t always mean you need a bifocal. Your visual requirements are unique to you and the lens you require may not necessarily be the newest, high tech progressive on the market. These work well for the person who is just beginning to have trouble reading small print. This lens type is low tech and inexpensive. Put them on to read, take them off when finished. Invented around 1784 by Ben Franklin, these lenses were called Flat-Top Bifocals because of the line across the centre. These lenses were designed to give the wearer the freedom to walk around with their glasses on all the time. The top portion of the lens would be for distance and the bottom would be for reading. Despite having a line across the lens that is visible, this low tech lined bifocal provides good distance vision, and a generous area for reading and a good price point. 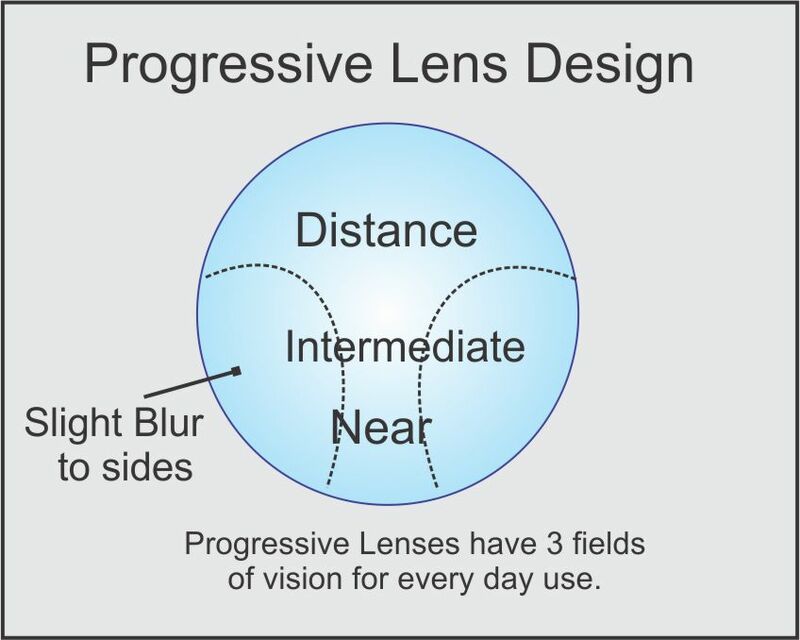 Simply explained, we have 3 types of progressive lenses. These were originally designed several decades ago to replace the old “Lined Bifocals”. 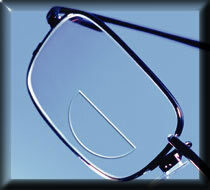 Lined bifocals provide good distance and good reading fields but provide no intermediate or arms length vision. Computer screens, the dashboard on a car or an item on a grocery store shelf would all be examples of intermediate vision. These new Progressives were designed with 3 distinct fields of view. Distance, intermediate and reading. With this added intermediate zone it gave people what they had been missing. A higher tech lens, more expensive than lined bifocals, a lens designed to give the wearer a more complete visual experience……… but it was not without it’s problems. One complaint commonly heard by Opticians concerning their progressives is that the “field of view” for reading is too small, meaning that they can focus but the area in focus is too small. They might be able to read 1 or 2 columns in the newspaper but would like to be able to read the entire page easily. Another common complaint was having to lift their heads to see the computer screen through the intermediate portion of the lens. Digital Progressives, also known as Free-form or High Definition Progressives are the newest progressive lens technology. Digital is not actually a type of progressive lens but rather a manufacturing process used to create progressive lenses that can produce a more accurate, customized product. By providing the lab with very specific measurements of the customer and the chosen frame, the Optician is able to “customize “ the progressive lens design to give the wearer better and bigger fields of view for reading and less overall distortions. This lens is almost always more expensive than Conventional Progressives and will often improve overall visual performance for reading and the computer, but to say that everyone will see better with a digitally designed progressive is just not true. For those individuals whose intermediate and near requirements are so specific the newest progressive designed focuses specifically on those 2 fields only. These lenses were designed mainly for the person who works long hours in front of a computer screen. 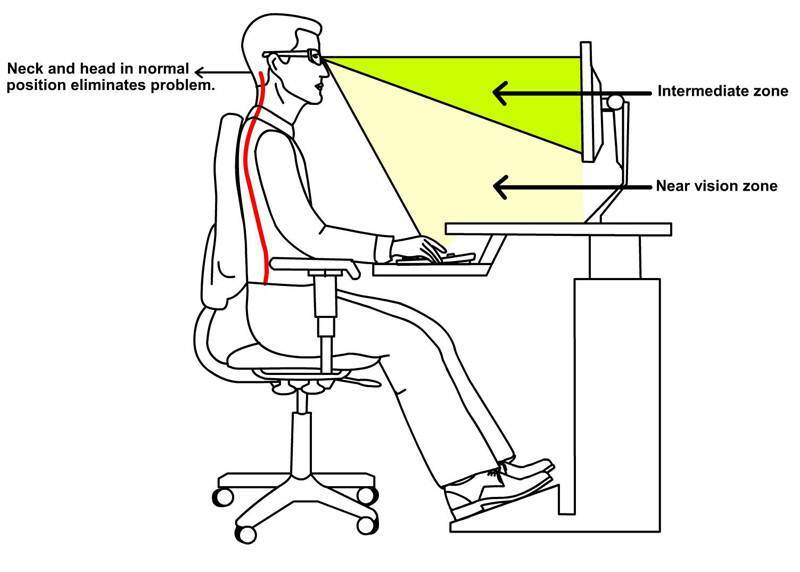 The “Office Progressive “ is specifically designed with the intermediate or arms length vision on top to give the wearer a wide field of view for looking at the computer screen and a wide field of view for reading on the bottom portion of the lens to look down at the keyboard or to read print on the surface of the desk. These lenses also allow you to walk around the office and give good focus up to 8 feet away. These lenses are generally very effective. Computers can do a lot of amazing things, fitting a pair of eyeglasses is not one of them.